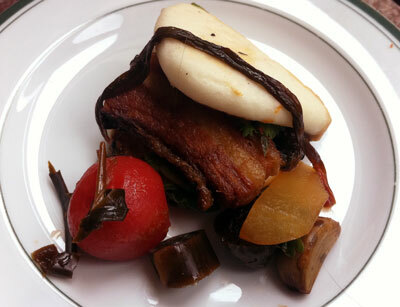 The menu item that most excited me was the pork-belly steamed bun. I love pork buns, and there isn’t any place in town to get a good one. Until now. This little number is a lovely chunk of crispy pork belly topped with hoisin sauce folded into a nice, fluffy steamed-bread wrapper. It comes paired, like everything else on the menu, with a selection of house-made pickled veggies, some of which (the baby leek kimchi and jalapeños) are better than others (the garlic and tomato), but all of which are tasty. And the whole shebang is only $2.50. Sweet. Next came the Chadillac, Shindigs’ chicken burger. It’s two slices of grilled chicken, pounded flat, with a generous layer of country ham in between, plus cambozola cheese and a magnificent caramelized-onion-and-fig mostarda. This thing is a winner, though the mild cheese kinda gets lost among all those other strong flavors. Honestly, they coulda left the cheese out and it would have been just as good. But I’m nitpicking. But things went downhill with Nadria’s Lower Alabama, Shindigs’ veggie burger. 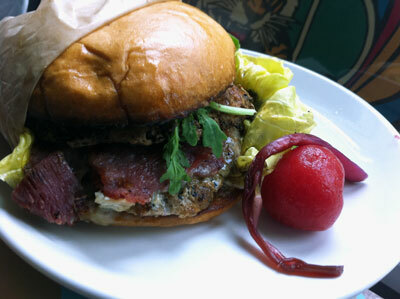 Nadria is something of a Birmingham-veggie-burger connoisseur, so of course she had to try this one. You can’t tell from the photo, but the patty itself is bright red in color, so it’s obviously made with a lot of beets, plus some grains of some kind (I think I detected brown rice and possibly oats but I’m not sure). It tastes pretty good (though there’s a bit too much beet sweetness), but the real issue is the texture. The thing doesn’t hold together as a patty at all—it’s like eating a mashed-potato sandwich. And the mushy patty, combined with the (quite tasty) avocado-tarragon puree on top unfortunately leads to a soggy bun after about five minutes as well. All of this made Nadria a sad panda. I hope the Shindigs folks work on reformulating it; they certainly have the creativity to pull it off. We also had an order of fries, which were good if not world-changing, and came with a tasty “Not 2 Fancy” sauce. The sauce tasted like a mix of blue cheese dressing and yogurt, with maybe a tiny bit of ketchup mixed in for color. It’s interesting, and goes well with the fries, and I was glad to get something other than a foil packet of ketchup from the truck. And in the interest of completeness, we also grabbed an order of the Elvis bread pudding. (It’s peanut butter and banana, get it?) It’s very good stuff and peanut-butter bread pudding isn’t something I’ve ever seen before—more cleverness from the Shindigs chefs. But it was cold by the time we got to it and would have been better warm. My advice if you want dessert: Eat your main course first and then come back to the truck for bread pudding. 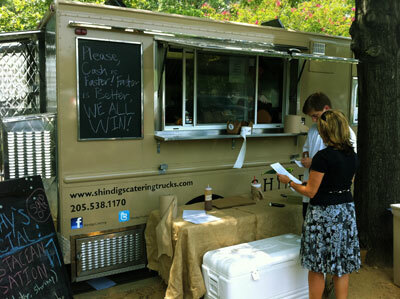 All in all, Shindigs is everything you could want in a food truck: innovative dishes made by quality chefs from sustainable ingredients and sold for very reasonable prices. (They even take credit cards!) If the line of people in scrubs in front of the truck at 12:30 on a Friday is any indication, Shindigs won’t be Birmingham’s newest food truck for long. Um, yum. Gotta go there soon! I had the veggie burger today and thought it was excellent. 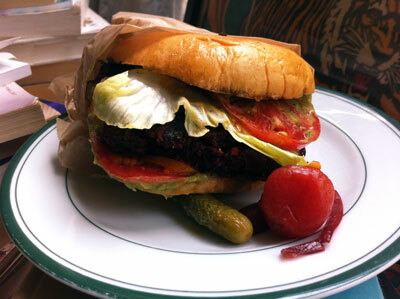 I’m used to veggie burgers being mushier than their meaty counterparts, so the texture really wasn’t an issue for me. I think toasting their buns a little longer would effectively counterbalance any textural issues without altering the flavor of the patty itself. The taste was so good, in fact, that I did not even come close to reaching the 5 minute threshold for sogginess as discovered by Nadria. Therein lies the difference in our experiences.